Mix 1 packet of ASSAULT™ in 8-12 oz. (236-354 mL) of water 20-30 minutes before training. For optimal results, drink a minimum of 1 gallon of water daily. Calcium Silicate, Natural & Artificial Flavors, Sucralose, Purple Carrot Extract Powder (for color), Citric Acid, Salt, Medium Chain Triglyceride Powder, Potassium Chloride, Acesulfame Potassium. Allergens: Contains Tree Nuts (Coconut). This Product Was Produced In A Facility That May Also Processes Ingredients Containing Milk, Egg, Soybeans, Shellfish, Fish, Tree Nuts, Wheat And Peanuts. STORAGE AND MAINTENANCE: Due to the amount of active ingredients in this product, shake once daily and before use to ensure proper ingredient mixture and effectiveness per dose. Store this product in a cool dry place. This product is packed by weight not volume: some settling may occur during shipping. Choline Bitartrate, Glucuronolactone, PurEnergy™ Matrix (Caffeine Anhydrous, Pterostilbene), Hperzine A. Natural and artificial flavors, calcium cilicate, sucralose, red beet juice powder (for color), citric acid, medium chain triglyceride powder, acesulfame potassium. Contains tree nts (coconut). This product was produced in a facility that may also process ingredients containing milk, egg, soybeans, shellfish, fish, tree nuts, wheat and peanuts. Suggested Use: Mix 1 scoop of Assault in 8-12 oz of water 20-30 minutes before training. For optimal results, drink a minimum of 1 gallon of water daily. Notice: Powder density may be affected by settling which may cause variations in the scoop serving size and fill levels from bottle to bottle. Storage and Maintenance: Due to the amount of active ingredients in this product, shake once daily and before use to ensure proper ingredient mixture and effectiveness per dose. Natural & Artificial Flavors, Sucralose, Citric Acid, Red Beet Juice Powder (for color), Medium Chain Triglyceride Powder, Natural Blue Color (Fruit Juice Concentrate, Gum Arabic, Citric Acid, Tricalcium Phosphate), Acesulfame Potassium. This Product Was Produced In A Facility That May Also Processes Ingredients Containing Milk, Egg, Soybeans, Shellfish, Fish, Tree Nuts, And Peanuts. This Product Was Produced In A Facility That May Also Processes Ingredients Containing Milk, Egg, Soybeans, Shellfish, Fish, Tree Nuts, Wheat And Peanuts. Natural & Artificial flavors, Calcium Silicate, Sucralose, Red Beet Juice Powder (for color), Medium chain Triglyceride Powder, Citric Acid, Acesulfame Potassium. Allergens: Tree Nuts This Product Was Produced In A Facility That May Also Processes Ingredients Containing Milk, Egg, Soybeans, Shellfish, Fish, Tree Nuts, And Peanuts. 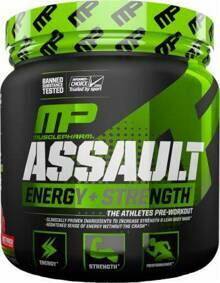 Mar 09, 2016 MusclePharm Assault New Formula (2016): NO PUMPS?! MusclePharm Assault is the top-selling pre workout from one of the biggest names in the business. Blue Arctic Raspberry This is a Buy 1 Get 1 FREE offer! Strawberry Ice This is a Buy 1 Get 1 FREE offer!